Sealed Air and Pepsi-Cola Philippines Products, Inc. (PCPPI), along with several other global companies, have joined forces to provide 300,000 liters of potable drinking water encased in water pouches to the Philippines in the wake of Super Typhoon Haiyan (also known as Yolanda in the Philippines) that hit the country on November 8, 2013. Each pouch contains 2.5 litres of potable drinking water, and PCPPI and Sealed Air will be sharing 8 pouches per affected family. Pamaskong PaTubig is intended to help approximately 15,000 families in the Visayas region who are still recovering from the effects of Yolanda. Sealed Air will provide 120,000 flexible pouches which are typically used for packaging liquid foods, such as condiments. Pepsi will be providing purified water used in all of its world-class products to fill the pouches using Sealed Air equipment at PCPPI’s Muntinlupa plant in the Philippines. Other contributing companies include The Dow Chemical Company which donated DOWLEX™ Polyethylene resins to manufacture the pouches, Quality Corrugated Inc. which donated carton boxes, and DHL Global and ACA International which provided airfreight. 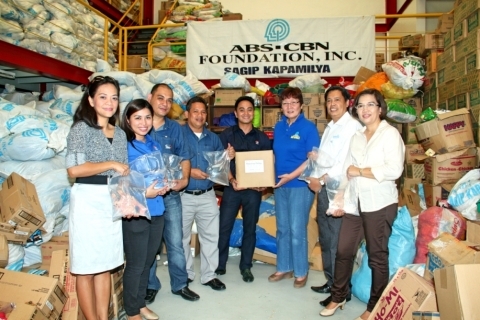 The initial batch comprising of 4312 pouches of potable water were delivered to the Sagip Kapamilya Foundation, the emergency humanitarian assistance program of ABS-CBN Foundation, Inc. in the Philippines. Distribution by Sagip Kapamilya will enable the local population to receive the clean water. In the Philippines, Sagip Kapamilya provides food and non-food relief to affected communities of disasters, as well as engages in rehabilitation and disaster risk reduction projects. Pamaskong PaTubig is the latest effort of PCPPI in its humanitarian assistance for Yolanda recovery efforts. In less than a week after the typhoon left the Philippines, PCPPI’s US and South Korean parent companies, PepsiCo International and Lotte Chilsung, were able to donate over USD 1 Million in international aid. PepsiCo International Foundation contributed one million US dollars to four partner agencies: American Red Cross International Response Fund, Give2Asia, Habitat for Humanity International and Save the Children. The Lotte Group of Korea in turn, donated one hundred thousand US dollars to the International Red Cross. Adding to this, PCPPI CEO Yeon-Suk No and President Partho Chakrabarti donated two million pesos in cash (approximately forty-five thousand US Dollars) and over PhP 700,000 (equivalent to USD 15,750) worth of leading Pepsi product Tropicana Coco Quench to the ABS-CBN– Sagip Kapamilya Foundation last 15 November 2013. “The access to clean drinkable water in the aftermath of a disaster is always the primary concern. Sealed Air is proud to be part of this coordinated effort where the technical capabilities and employee enthusiasm of several companies make a difference to those in need. The sense of urgency brought different teams together to complete this project in just a matter of weeks. This is ingenious collaboration at its best,” said Yagmur Sagnak, President, Asia, Middle East, Africa and Turkey, Sealed Air. In addition to potable water, Sealed Air has also donated cleaning chemicals to Sagip Kapamilya as well as US$50,000 to The Philippines Red Cross. It has also embarked on a global employee donation drive and pledged to match employee donations up to US$100,000 made to the World Food Program USA. About Pepsi-Cola Products Philippines, Inc.
Pepsi-Cola Products Philippines Inc. is the exclusive bottler of PepsiCo beverages in the Philippines, with a relationship spanning 66 years. Lotte Chilsung, one of the biggest beverage companies in South Korea, is the lead shareholder of PCPPI as an independently-listed company and co-manages it with PepsiCo. PCPPI manufactures and sells well-known brands such as Pepsi-Cola, Mountain Dew, 7-Up, Mirinda, Mug, Gatorade, Tropicana, Lipton, Sting, and Premier. It has established manufacturing facilities across the country, serving at least 500,000 outlets and providing employment through its extensive distribution network. To learn more, please visit us at www.pepsiphilippines.com. Dow (NYSE: DOW) combines the power of science and technology to passionately innovate what is essential to human progress. The Company connects chemistry and innovation with the principles of sustainability to help address many of the world's most challenging problems such as the need for clean water, renewable energy generation and conservation, and increasing agricultural productivity. Dow's diversified industry-leading portfolio of specialty chemical, advanced materials, agrosciences and plastics businesses delivers a broad range of technology-based products and solutions to customers in approximately 160 countries and in high growth sectors such as electronics, water, energy, coatings and agriculture. In 2012, Dow had annual sales of approximately US$57 billion and employed approximately 54,000 people worldwide. The Company's more than 5,000 products are manufactured at 188 sites in 36 countries across the globe. References to "Dow" or the "Company" mean The Dow Chemical Company and its consolidated subsidiaries unless otherwise expressly noted. More information about Dow can be found at www.dow.com.